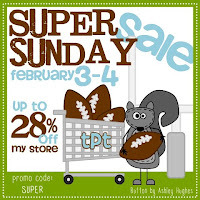 Just wanted to let everyone know that I am participating in the huge Super Bowl Sunday Sale at TpT. I am offering 20% off all of my products and TpT is tacking on 8% off to make a Grand Total of 28% off!! It is time to clear out that Wishlist friends! Just enter the promo code "SUPER" at checkout. Happy shopping everyone and GO....Wait...who's playing the Superbowl? I'm so clueless when it comes to football..but I love the commercials! !